Researchers from the Medical Advanced Manufacturing Research Centre (AMRC) are working with a former soldier who caught a devastating disease in Afghanistan to develop an advanced mobility aid that could change the lives of millions of disabled people. Corporal Phil Eaglesham contracted Q Fever – also known as Helmand Fever - during active service in Afghanistan. The former Royal Marine Commando, who was part of Britain’s Paralympic Squad in Brazil, is forced to rely increasingly on mobility devices as his condition deteriorates and his reliance has led him to try and create something more suitable for every user. The University of Sheffield Advanced Manufacturing Research Centre (AMRC) with Boeing is a world class centre for advanced machining and materials research for aerospace and other high-value manufacturing sectors. It secured funding to move into new areas and the Medical AMRC ensures the results of internationally significant research are developed into products and brought to market quickly and cost effectively. Based in the centre's Design, Prototyping & Testing Centre on the Advanced Manufacturing Park in Rotherham, the Medical AMRC sits alongside the current AMRC and has access to all the current resources but with a dedicated team which will specifically focus on the medical technologies sector. 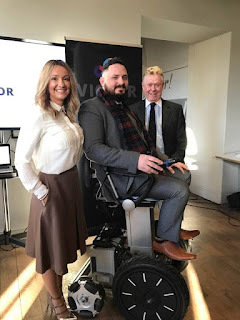 Phil, his wife Julie and businessman Brian Meaden, set up Conquering Horizons to try and create a mobility device with none of the drawbacks of conventional wheelchairs and scooters. With funding support from the Royal Marines Charity, Conquering Horizons called in the Medical AMRC to assess whether the concept was feasible and create the beginnings of the design. Phil identified six key failings affecting current mobility devices, all of which are being addressed by VICTOR, the new device being developed at the Medical AMRC. VICTOR incorporates an adjustable lifting device that can raise users to a "social height," enabling them to look people in the eye, avoid being talked down to and sit at the right height to eat or work. It is designed to tackle difficult terrain, mount kerbs, fit through standard doorways and manoeuvre easily, thanks to multi-directional wheels that give it a turning circle just slightly larger than its wheel base. VICTOR is also modular, so that it can be modified as a user's condition changes and is designed to look good. Marcus Crossley from the Medical AMRC said: "VICTOR has a completely fresh, modern appearance that is far-removed from the stigmatising, institutionalised image of existing devices. "Our aim, from the outset, has been to create a device that able-bodied people would want to be seen on." Julie Eaglesham from Conquering Horizons, added: "Having this device will enable Phil, millions like him, to gain a more active, independent and normal life. "This will not only give them an amazing physical advantage but will also have a hugely positive impact on their mental health, and allow them to lead a more active and involved life. "For Phil, in his role as a father of three lively boys, the ability to travel on most surfaces or terrains and the support, comfort and control of a device that he has complete confidence in, will be revolutionary." Researchers from the Medical AMRC travelled to London to speak at a launch and fund raising event at the Imperial War Museum. Marcus Crossley added: "Phil is an inspirational person and raising money to develop Victor could have a major impact on the lives of millions who need to use mobility devices and their families. "VICTOR needs more development work in order to get to a position where it can be sold to the public and we are actively supporting Conquering Horizons as it seeks to raise the necessary finance through its crowdfunding appeal."